Main point: Fiats product lineup will complement Chryslers. DETROIT — Chrysler LLC and Fiat S.p.A. design executives were to begin meeting last week to determine a North American portfolio for their new alliance. 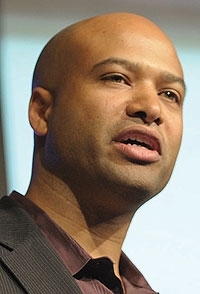 "This week and the months following we will meet with the design studios at Fiat and figure out" what Fiat vehicles will be adapted for the United States, said Ralph Gilles, Chrysler design vice president. He spoke at the Automotive News World Congress on Wednesday, Jan. 21, a day after the two companies said Fiat would take a 35 percent stake in Chrysler. Gilles said the Fiat brand is strong in Europe's minicar, subcompact and compact segments, so vehicles that size "make sense for Chrysler." "There may be situations where we can bring their vehicles in as is, and there will be great opportunities to do products based on the Fiat DNA," he said. "When you look at our portfolio," Gilles said, it is "somewhat truck-heavy, very practical vehicles, SUVs, four-wheel-drive. Great for this climate, but maybe not the overall solution that we need. So they come in and complement us." Rebadging some Fiat vehicles is an option. "There are some natural fits where it may make sense, but right now we are in a very broad investigation mode. We are looking at all the opportunities," Gilles said. One possible import is the Fiat 500, a popular small car in Europe that draws on the styling themes of the 1960s Fiat 500. "The Fiat 500 has taken Europe by storm. They can't make it fast enough," Gilles said. He said he and his wife drove the 500. "It is such a fun package. I think Americans, given the chance, will fall in love with this thing." "There is a lot of collaboration going on," he said. "The guys are really enthusiastic. They want to see what we got, and I want to see what they got. That is pretty much where it is right now." "The passion inside Fiat is amazing. I mean, from their Formula One cars, the Alfa Romeo lines, the new 500, you can see that design is a real big deal over there. The Italians are known for design. I am pretty enthused by it."